Farmer jed works very hard to care for all his animals on the little people caring for animals farm, and he would love some help from your tiny farmer. Toddlers will love learning how to take care of all their animal friends, from feeding The chickens to tucking in the horse with a soft blanket, and exploring all the exciting activities on this farm. Get the fun started by pressing the discovery button to pop open the stall doors and hear fun songs and phrases. Or open up the hayloft for drop-through fun that activates more sounds and phrases! Then little farmers can press the discovery button to "hatch" The chicks, turn the silo to rotate the corn crop (pop pop pop! ), and so much more! Ding Ding Ding - ring The bell to let all the animals know it's dinnertime, then feed some of the corn to the chickens! 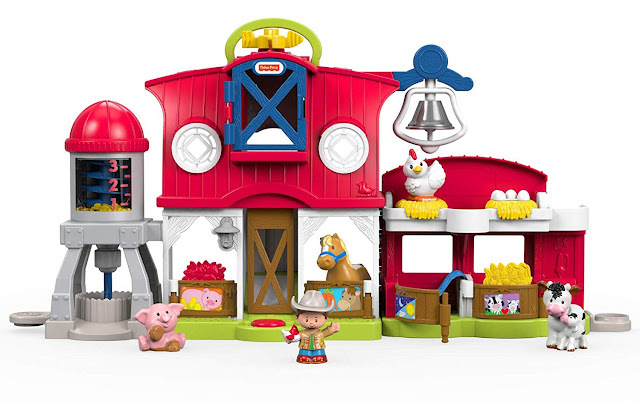 This activity-packed little people playset is more than a farm - it's a home for all your toddler's new friends. Where development comes into play sensory: the farm offers tons of sensory-stimulating fun for little ones - from the bright colors, songs &amp; sounds, to the variety of materials for their tiny hands to explore!